Our bulk therapeutic chapsticks are medicated against infections, itching, and soreness, and with SPF15 protection against sunburn and frostbite. The Therapeutic Chapsticks contain Camphor (anti-infective agent), Menthol (anti-itching agent), Phenol (for soreness relief), Salicylic Acid (exfoliant). #1 Giveaway Item in Health Care, better than Blistex! 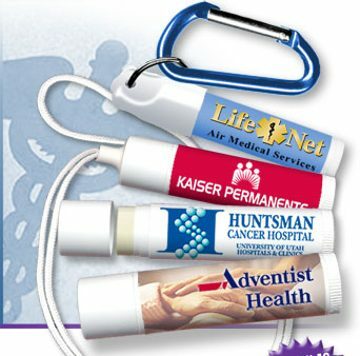 Our promotional therapeutic chapsticks are FDA approved and sell for the Budget Prices in the USA. Free artwork design. American clients pay no taxes. You may add inexpensive lanyards and carabineers to our therapeutic chapsticks (see OPTIONS below the Price Table). Prices below includec your custom imprint in full color (unlimited number of colors). Set-up Charges: $45.00. No extra charge for full color! Add a lanyard: $0.50 per unit. Add a carabiner: $0.90 per unit. Imprint Size: 1 7/8" H x 1 1/2 W" in full color (unlimited number of colors). Net Weight: 0.15 oz. , 4.5 g.
Engineered with Premium Quality for the Health Care Profession! Flavors: Cherry, Mint, Vanilla, No Flavor, Coconut, Strawberry, Tangerine, Lime. The therapeutic chapsticks are perfect for many types of outdoor activities: Golf, Skiing, Hiking, Swimming, Cycling, Horse Back Riding, etc. We believe that we have the Budget Prices for therapeutic chapsticks in the USA and Canada. In case you find a lower price for the same item, we will match it and shipping will be on us.